What is a Furled Leader? A furled leader is a tapered leader made by twisting multiple strands of small diameter fiberundefinedsuch as 2- or 4-pound monofilament as used for spinning reels. Two or more lengths of these twisted fibers are then twisted together. A furled leader's taper and length can be varied to taste, and furled leaders are very effective at turning over long lengths of tippet. The construction is inherently springy, so it has excellent shock absorption. The jig described here is for making a leader comprised of two twisted-fiber legs, which will then be twisted together to make the leader. For a jig of the dimensions shown in the illustration, a board eight feet long and six inches wide will do. Three-inch long pegs made from one-inch diameter dowel can be attached by wood screws screwed from the back side of the board. However changing the pegs around a lot wears the screw holes in the pegs. A better way is to use Tee-Nuts on the back of the board and hanger bolts on the pegs. Don't go short on the peg dimensions or you will have clearance difficulties setting up the leaders. 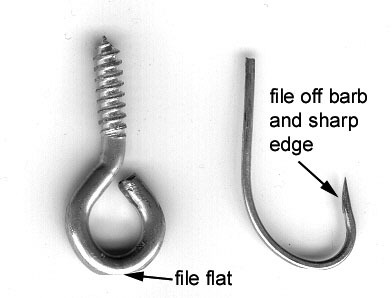 A screw-hook is screwed in firmly at the top of the jig; a nail with a head is nailed firmly at the bottom of the jig at a position about 10% of dimension C up from the end Peg. The next item needed is a 1/4-inch electric drill whose rotation can be reversed. Most drills have this capability. A hand drill could also be used. You will need two hooks undefined done for each leg. For the first leg that you will twist (it doesn't matter which leg is twisted first) you'll need a hardware store screw-eye made of 3/16 inch material. It needs to be modified for the work it will do. Pry open the eye enough that you will be able to slip the leader material through, but not so open that the screw-eye would slip off the nail indicated on the jig. File a flat area in the location shown. This creates clearance necessary for when both legs get twisted together. For the second leg you will need a 1/0 fishhook made of at least 1/16-inch diameter wire (most drill chucks won't hold a shaft smaller than this diameter). It must be modified, too. Carefully file off the barb and any sharp edge going away from the point. Leaders can be made of a variety of fibers depending on the weight and strength desired. I have successfully made them from 2- and 4-pound test spinning reel monofilament (e.g. Stren, Berkley, etc. ), from 6/0 Uni fly tying thread, and from "invisible thread" (This is a mono-filament sewing thread, equivalent to about 7X tippet). One I made from size A rod building thread would have made a dandy dry fly leader for a 15-weight, if there were such a requirement undefined so there is a practical upper limit. Normal monofilament is just slightly denser that water so it will tend to float, especially if greased with floatant. For a sinking leader use fluorocarbon line, which is about twice as dense as water. Each leg of the leader is rigged as shown in the illustration. That means you'll go through the following procedure once on the right side of the jig and once on the left side of the jig. You should be working with your chosen filament material on a spool. Keep moderate tension on the spool as you form the series of loops. The whole affair wants to be tight enough that it's not drooping between the pegs, but not under any great tension. 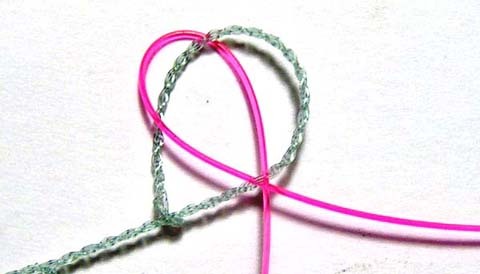 Start with a small overhand-knot loop hooked over the screw-hook. 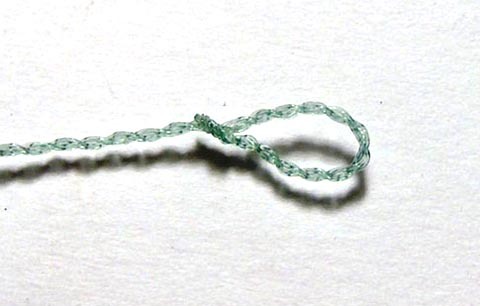 There is no need for a fancier knot like a double surgeon loop. Wrap five whole loops between the screw-hook and the first peg. After the fifth complete wrap, take the fiber material (referred to as the strand after this) down to the second peg (on the same side as the first), come around peg two and back to peg one. Don't go around peg one; rather, pass the strand (and the spool it is on) through the space in between the right and left sides of the five loops, then draw the strand to the side of the first peg away from the screw-hook. This strand is looped through the first five strands, but not wrapped around peg one. Go to the second peg again, around, and back to the first peg, again going between the five loops. There are now two complete loops between the first five loops and the second peg. For the last segment, take the strand down to the end peg, back once through the two loops at peg two, and back to peg three. Finish with an overhand-knot loop hooked over peg three. The other leg must be laid out now. Repeat these steps, but wrap around the pegs on the other side of the jig. Notice that they are not positioned the same as those for the other leg, but the length of both legs is the same. When done you will have two legs ready for twisting. Each leg will have this composition: eleven strands (five full loops plus one strand going to the second peg) between the hook and the first peg: six between the peg one and peg two; and three between peg two and peg three. When the furling is done, on account of the difference of longitudinal positioning of the pegs on the two sides, there will be: twenty-two strands, followed by seventeen, followed by twelve, nine, and finally six. Thus the desired tapered effect is created. Put the screw-eye (with the filed-flat top) in the drill chuck. Set the drill to turn in the right-hand direction. Slip the other loops of this leg off the pegs. You are ready to begin twisting this leg when it is stretched between the screw-hook at the top of the jig and the screw-eye chucked in the drill. The twisting is the next step, but how long should you run the drill? As the leg gets twisted up, it tends to shorten. When its length has shortened by about ten percent, it is about time to stop twisting. This does vary a bit with the material. Another approach is to do an estimated number of turns. My drill turns 1000 rpm. For 4-pound mono, for the jig dimensions shown, I find about 750 turns (forty-five seconds at 1000 rpm) is about right. Two-pound mono seems to want about 1000 turns (sixty seconds). For the Uni thread and the "Invisible Thread" about 1250 turns (seventy-five seconds) will do it. YMMV (Your mileage may vary). Keep the side you are twisting well away from the other side or it will tend to grab the other side creating an un-salvagable mess. The twisted leg will have to be kept under tension while you are twisting it and when you are disengaging it from the drill. If the tension is eased, the leader will furl up on itself. You will have a hopeless snarl on your hands if it does. Zero your stop watch. Put some tension on the leg and start the drill. Stop twisting (by time or by shortening). Carefully release (keep the leader taut) the screw-eye from the drill chuck and hook the screw-eye over the nail, which is positioned to maintain tension. To twist the second leg, chuck the fishhook in the drill, hook the strands of the second leg on peg three, and twist up this leg the same amount and the same direction as the first leg. Now we are ready to do the final furl to complete the leader. Reverse the direction of the drill. Before you start the drill, check both legs to make sure that bits of them haven't self-furled during the process of transferring leg one to the fishhook. If that has happened, these self-furlings will be sticking out at right angles to the leg and will be in the first twelve inches or so of the thin end. This is not fatal; the cure is to apply a bit more tension and massage the little self-furls out with your fingers. If, after you have started the final furl, you discover one of these, reverse the drill and unwind to the starting point. Massage it out. Resume the twisting. So how long to run the drill? Do it until you feel the leader start to shorten up a bit. That much is actually a bit too much twist, but it's not a problem, as it's easily worked out as soon as one end of the leader is free. The nicest way to finish a furled leader is the Shorb Loop Technique. This is done at each end. The preferred tool for doing this is a large size Cortland splicing needle. 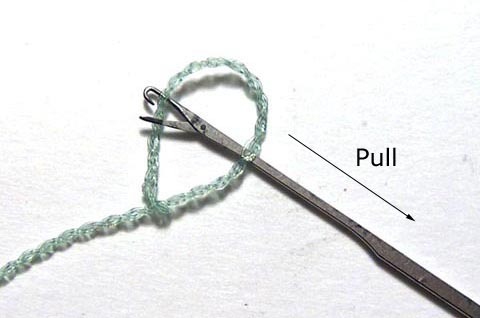 There is a similar gadget called a "Knit Picker" for fixing snags in knit cloth which will work. An alternate method will also be shown. Make a lasso with the loop at the end of the leader formed in the construction. In the standing side of the lasso (the side away from the loop), insert the splicing needle between the two major strands of the leader. Lacking a splicing needle it can be done with a short piece of stiff monfilament. As above form a lasso. Push both ends of the monofilament between the two major strands of the leader on the standing side. Capture the opposite side of the furled leader loop in the mono loop that has been formed and draw it through. Obviously there is much scope for experimentation in making furled leaders. They can be made longer or shorter by varying the peg spacing proportionally. The taper can be adjusted by altering the relative spacing between pegs and/or the number of loops in each segment of the legs. Other materials can be used to get different performance. The basic ideas for making this leader come from an article at globalflyfisher.com by a Dutch fly fisher, Henk Verhaar. See Twined Leaders. Also see Claude Freaner's web article Making Furled Leaders. The Shorb Loop was originally described by Skip Shorb in note "The Shorb Loop".